Antarctica, an ice-capped ink blot test | Daily Review: Film, stage and music reviews, interviews and more. Among the most amazing things about our most southern continent—and there are many—is that it is a landscape of peace. Antarctica is the only place on earth that has never seen war, the only place that is governed by no one country but by a treaty that stipulates science, collaboration, and peace. It is a place whose only permanent inhabitants are wild animals (among them, penguins, seabirds, seals, and whales) and whose only human inhabitants are scientists and those who support their work. Yet given our newly precarious political climate, how long can this peace last? For decades, the world has shared the view of Antarctica as a place worthy of protection. Currently, mining, drilling, and any military activity is banned on the continent. Yet with Antarctic Treaty’s Protocol on Environmental Protection up for review in 2048, there is concern that this may change, making the continent akin to an ice-capped Rorschach ink blot test in which everyone sees something a little different. The leaders of Russia and China look at the continent and see untapped natural resources, which include fish, oil, minerals, and perhaps even diamonds (these countries have twelve and four Antarctic facilities respectively, with plans for further development). Antarctica is one of the few places on earth where animals roam without human predators, and where everyone works together for the common good. Naturalists look toward Antarctica and see wildlife struggling with changes in the climate and in their geography. 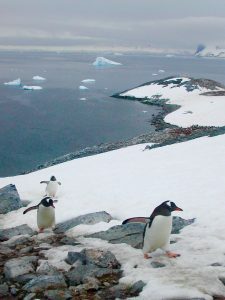 As one example, in 2010, a Rhode Island–sized iceberg displaced hundreds of thousands of Adélie penguins from their breeding grounds near Cape Denison. Such organizations as Oceanites return to the Antarctic peninsula year after year to count Adélie, chinstrap, and gentoo penguins to foster conservation of this evolving ecosystem. Tour operators everywhere see vast new itineraries. There’s no doubt that this is a landscape worth visiting—its sheer immensity, its towering icebergs and mountains, and its moonlike, otherworldly desolation make it a place like no other on earth. Yet how many footprints are too many in such a remote place? Since my own visit to Antarctica more than a decade ago, tourism has doubled, and the possibility of maritime accidents, as I learned from naturalists who travel and study there, is still a great concern in a cold, icy habitat where, should anything go wrong on a tourist vessel, rescuers are hours, if not days, away. While most travel takes place on the islands of the Antarctic peninsula, one cruise company now offers trips all the way down to the far more remote and icier Ross Sea. And then there are the thrill seekers who see in Antarctica a last great opportunity to leave their mark, whether ski tracks, marathon footprints, or bicycle treads. Whereas Antarctic travel used to be exclusively wildlife oriented, travelers can now run marathons, try “backcountry skiing” or take a “fat bike” cycling tour. And last November, the first commercial flight landed in Antarctica, paving the way for this faraway continent to become a mainstream destination rather than the long, hard-earned journey it has been known for. Explorers for more than a hundred years have seen in Antarctica a brutal and unforgiving land—the last unexplored continent. Today, we need to see Antarctica as it really is, a breathtakingly beautiful but fragile landscape whose creatures are at risk due to our human mistakes, from overfishing to pollution to global climate change. Fortunately, there are those who see the continent as in greater need than ever of protection; this year, the Commission for the Conservation of Antarctic Marine Living Resources (CCAMLR) established a marine protected area in the Ross Sea. Antarctica is one of the few places on earth where animals roam without human predators, and where everyone works together for the common good—yet the continent cannot fully escape what goes on in the rest of the world. As with any Rorschach test, we are judged by what we find within it—and in the case of the world’s final frontier, we must be sure our global society finds a shared vision that preserves and protects this continent for generations to come. Midge Raymond is the author of the novel My Last Continent (Text Publishing), and is co-founder of the boutique publisher Ashland Creek Press, which focuses on literature about the environment and animal protection.